You won’t see that bit anyway is a newly commissioned work by Manchester-based artist Nicola Ellis at Scunthorpe’s 20-21 Visual Arts Centre. 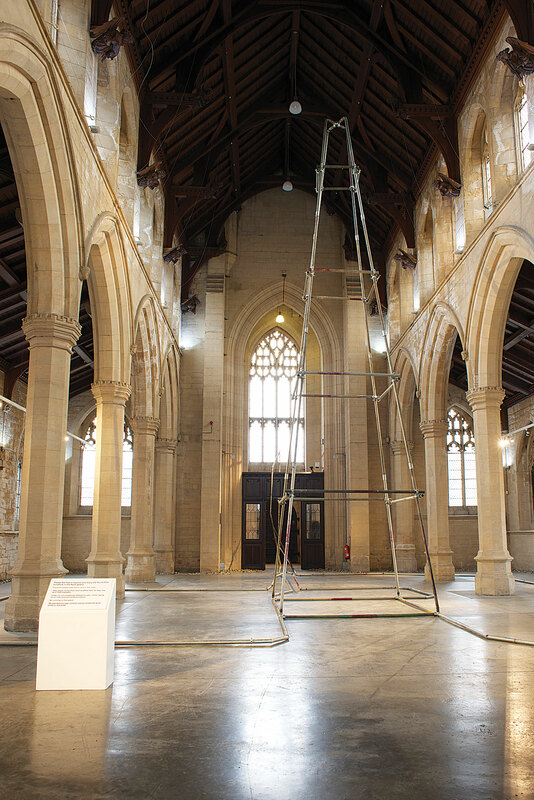 Responding to the historic 19th century church, Ellis’ work spans through the old nave, reaching high into the rafters of the building. Constructed from reclaimed, old scaffolding pipes and fixings, You won’t see that bit anyway has been made in direct response to the former church of St John the Evangelist. Complimenting her current research and 18-month project, Drawing Steel, this is Ellis’ first investigation into using metal and welding fabrication techniques and highlight’s the artist’s ambition and ability to respond to alternative spaces. The title, You won’t see that bit anyway, refers to the quality of Ellis’ craftsmanship, as she circumnavigates many of the welding and fabrication skills that she has learnt over the last six-months to embrace bumps, grooves and imperfections in the work that are visually intriguing and joyous. Identifying a quality inherent in a material and utilizing it in some way to make sculpture is the bottom line of Ellis’ practice. Much of her works are created through an exploration of ordered and chaotic materials, often directly reflecting the spaces they occupy. Through acts of sculptural ‘play’, in previous works she has transformed industrial materials such as polyurethane foam, silicone sealant, stone and glass into spellbinding large-scale organic forms, often appearing like stalagmites or fossilized beasts. Nicola Ellis lives and works in Manchester and is Supported by Mark Devereux Projects. Since graduating from Manchester School of Art with a MA in Fine Art, Ellis has shown in group exhibitions including; FOUR, Cornerhouse, Manchester, UK (2013); neo: artsprize, Bolton, UK (2012); Part of the Programme, FAFA Gallery, Helsinki, Finland (2012); Cabedal, Plataforma Revolver, Lisbon, Portugal (2012); and Paper 3, Paper Gallery, Manchester, UK (2012). 20-21 Visual Arts Centre is North Lincolnshire’s premier venue for the Contemporary Visual Arts. It is situated in the former St John’s Church building at the eastern end of the High Street in Scunthorpe town centre. Since opening in 2001 the venue has received over 500,000 visitors to its five gallery spaces, cafe and shop selling handmade gifts from leading makers. 20-21 Visual Arts Centre is a North Lincolnshire Council venue and is supported by public funding from Arts Council England.